What could be a more perfect way to incorporate the trend into your home than with some real wood shutters from Shutterly Fabulous? Spring is now officially here, and with that in mind we’ve become completely enamoured with natural tones and finishes for the home – and what could be a more perfect way to incorporate the trend into your home than with some real wood shutters from Shutterly Fabulous? With homeowners and designers rediscovering the beauty of sustainable, natural design – natural wood finishes are making their way back into our homes and are set to remain a huge trend over the next few years. The beauty of the trend lies in its versatility – as a wooden shutter can easily suit either a contemporary or traditional scheme. 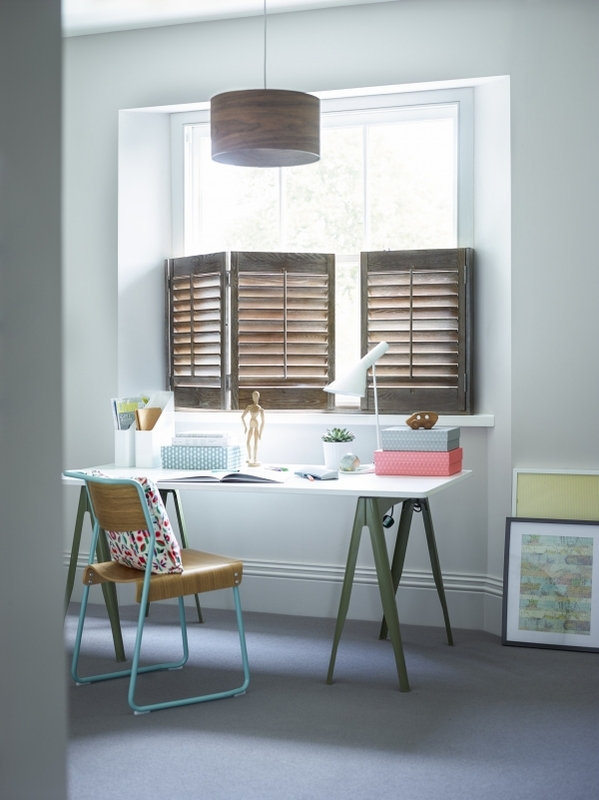 Traditionally, darker woods and tones tend to complement period properties and spaces – but as you can see in this home office (pictured) the dark driftwood café style shutters gives a layer of warmth to the space, whilst still remaining very much on trend. Juxtapose the warm, honeyed tones of natural wood with flashes of white or grey for a cool and contemporary effect, and maybe even go for pale pastel shades if you’re looking for a more up-to-the-minute interior scheme. Shutters are an excellent way of getting wood on your walls, and are far more subtle (and cheaper!) than real wood panelling. Remember – Shutterly Fabulous’ Poplar shutters come with the option of being FSC certified, so you can ensure that your shutters have been ethically sourced, too.